A better sweet potato casserole, with fancy lemon-citron marshmallows. Sweet Potato Casserole topped with warm, melty marshmallows is a Thanksgiving classic. But whenever I eat it, I find myself thinking “Why is this so awful? Who wants all the flavorless sweet glop next to their turkey?” Recently, I’ve been making savory, roast sweet potatoes instead of a casserole. But I thought perhaps by looking in to the origins of this dish, I might be able to retronovate a better modern casserole. Let’s see if it works! 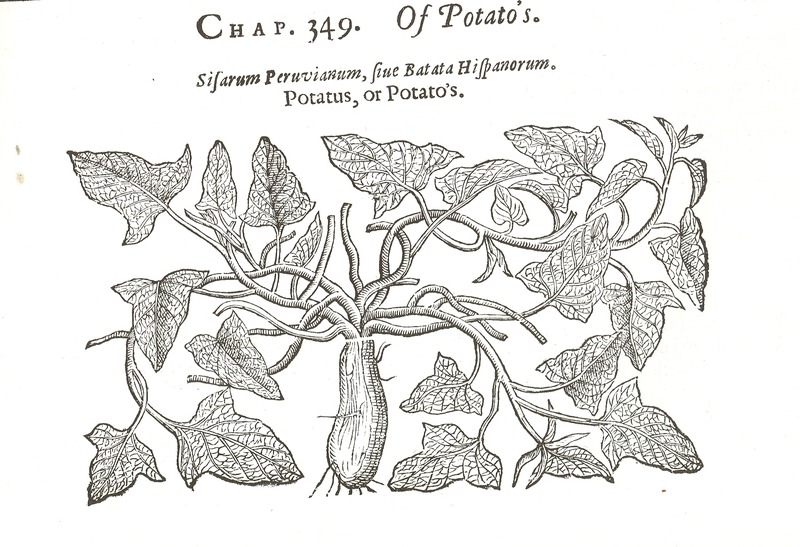 Sweet potatoes are a new world tuber, although they weren’t present at the Original Thanksgiving. Native to Central and South America, they were introduced to the North via colonists from Europe. Columbus is credited was transporting them home to the Old World (although he seems to be mis-credited with a lot of stuff) and by the 16th century they appeared in a British herbal encyclopedia, which recommends serving them “roasted and infused with wine, boiled with prunes, or roasted with oil, vinegar, and salt.” (source) Yum/Nom. 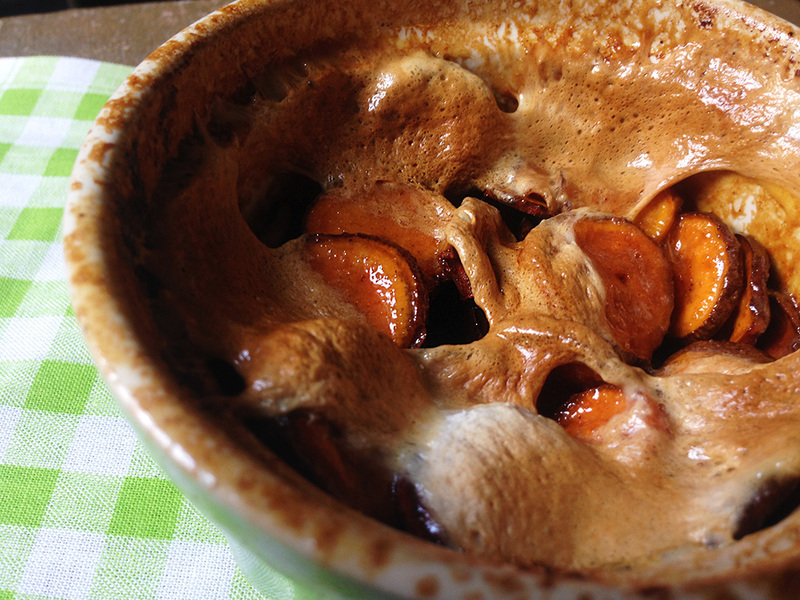 Historians suspect that this recipe for “potatoe pudding” is actually a sweet potato pudding recipe. It appears in the first America cookbook published in 1796, and we have definite sweet potato recipe examples by the 1830s, which would indicate they were pretty entrenched in American culture by that time. So let’s skip ahead to the marshmallows. 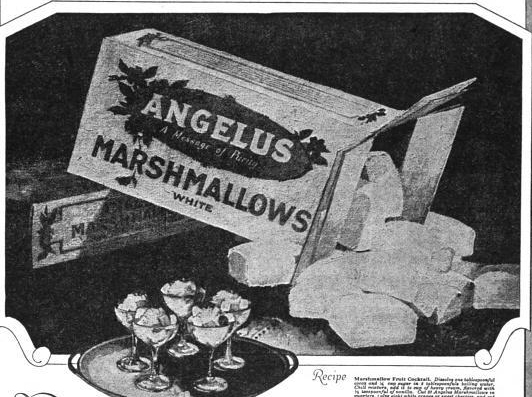 The first recipe to top candied sweet potatoes with marshmallows allegedly comes from a 1917 Angelus Marshmallow recipe booklet, but I haven’t been able to lay my hands on a copy to verify that claim. 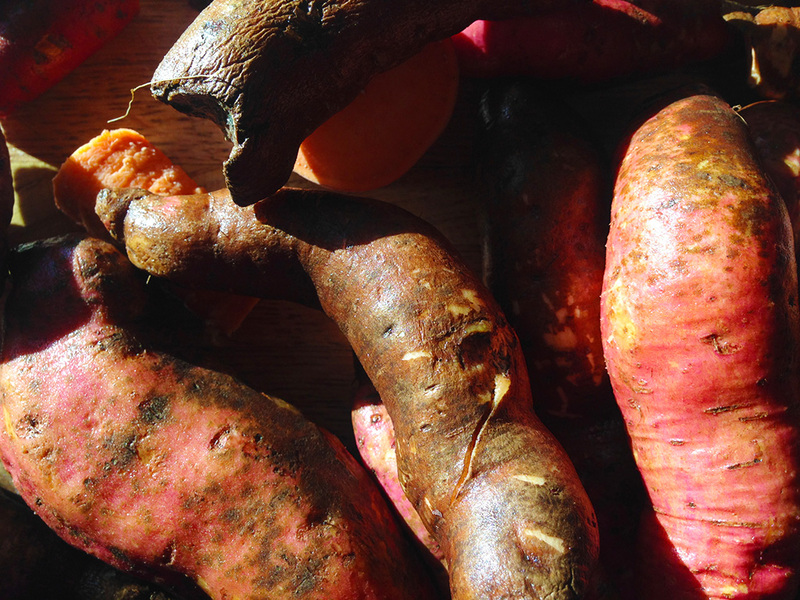 The earliest recipe I’ve seen comes from a 1918 trade journal called Sweet Potatoes and Yams. It’s filled with growing and storage tips for tubers, as well as casual racism. 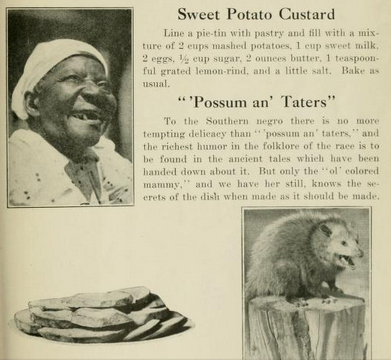 Let’s digress for a moment: imagine a world where racism is so embedded in the culture, that it was considered acceptable, if not hilarious, to include an image that compares a black woman to a possum in a trade journal about sweet potatoes. I debated not sharing this image, but I don’t believe in whitewashing history. Things sucked then; be glad for now, and always work towards a better future. Notice that the marshmallows in this 1920 ad are not the keg-shaped, dried out things we normally see in the grocery store. They more closely resemble what I would call “gourmet” marshmallows, that tend to have a moister texture and richer flavor. I realized that improving the quality of the marshmallows would greatly improve the quality of the dish. You can buy gourmet marshmallows online , in bakeries, and you can make them yourself . 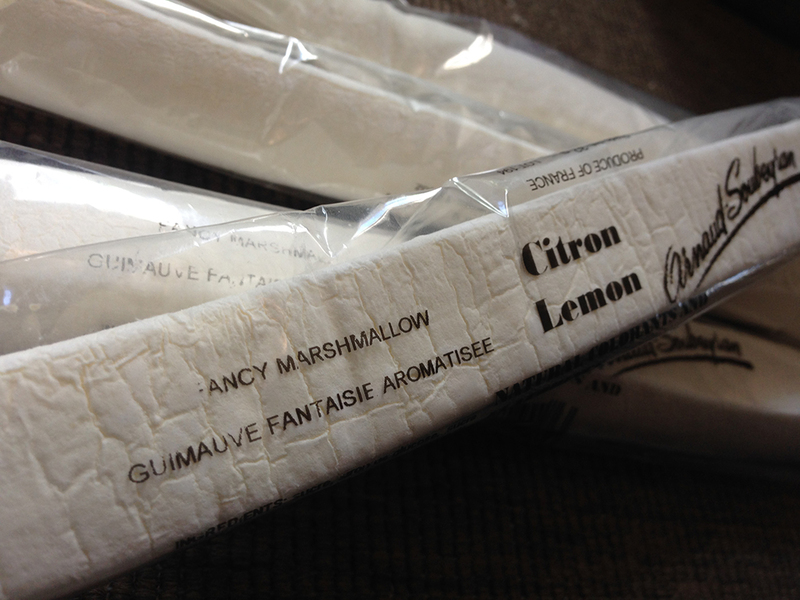 I wandered around Whole Foods trying to find a suitable product, and stumbled across these “fancy” Lemon-Citron flavored marshmallows, imported from France. Found only where the finest marshmallows are sold. Sweet potatoes from a farm in upstate New York. 1. There are two ways your can prepare your sweet potatoes: You can wrap them in foil and bake them whole for 1 hour at 400 degrees before slicing them; this preparation method will give you a softer texture for the final dish. Or, you can do like I did: simply slice the potatoes thin and add them to the casserole; this method results in a firmer texture. You can also choose to leave the skins on or peel them. 2. In a medium saucepan, combine sugar, water, cinnamon, lemon juice, and butter. Place over high heat until sugar is dissolved. Stir, then pour over potatoes in casserole dish. 3. Sprinkle potatoes with salt. 4. If you pre-baked the potatoes, bake 30 minutes at 350 degrees. If you just sliced them, bake 2 hours at 375 degrees. In the last five minutes of cooking, scatter marshmallows over surface of the potatoes and turn temperature up to broil. Keep a careful eye on them so they brown, but don’t burn. Cool on a rack. I thought the Lemon-Citron will pair well with the lemon juice in the casserole, and the short story is that it did. The whole recipe is probably the best sweet potato casserole I have ever had, blending the perfect amounts of spice, citrus, and caramelized sugar. Give it a whirl, experiment more, and I promise you it will be a great improvement to your Thanksgiving table. 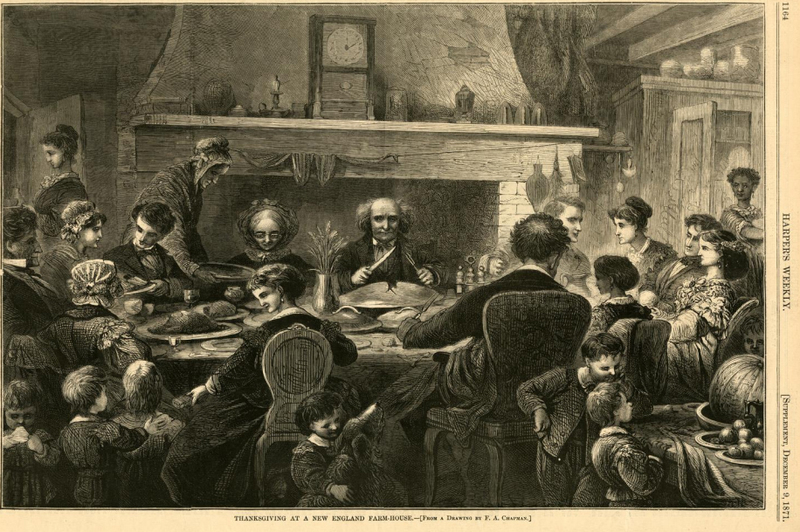 “Thanksgiving day Among the Puritan Fathers in New England” Harper’s Weekly, 1870. Courtesy the New York Historical Society. Did you know that 2013 is the 150th anniversary of Thanksgiving? I know what you’re thinking. What about the Pilgrims? Plymouth? 1621? Duh! For three days, the two groups partied together: playing games, firing guns, and eating. And what was on the table? We know there was venison, brought by sachem Massasoit and his men; we know there was wild fowl like turkey, shot by the Puritans. There was corn, too, from the harvest, probably prepared as a “pottage,” a thick soup. And since they were near the ocean, it’s likely they would have had an assortment of edibles from the water, like oysters, lobsters and (everyone’s favorite) eels. Additionally, the Puritans did not think of the 1621 feast as a day of “Thanksgiving,” which was a specific holy day declared during events of God’s divine intervention (end to droughts, etc). 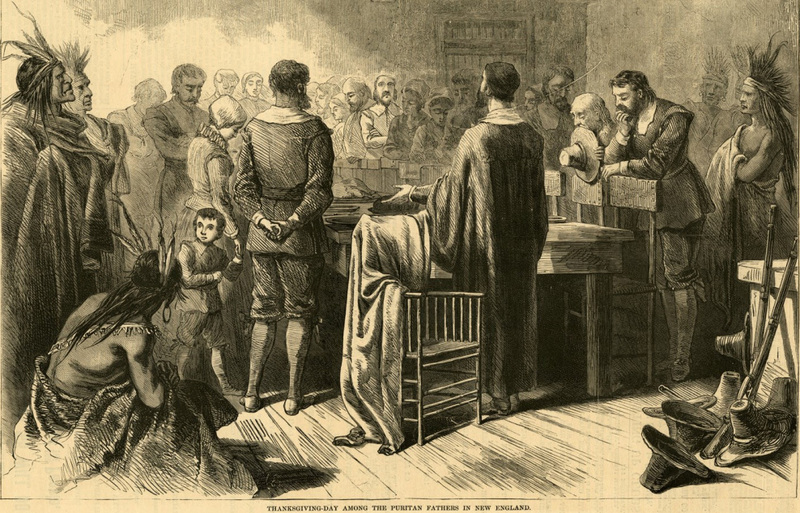 In an 1841 books called Chronicles of the Pilgrim Fathers of the Colony of Plymouth, scholar Alexander Young footnotes Winslow’s letter by calling it “the first Thanksgiving,” which is the first reference found referring to the event of 1621 by that name. Thanksgiving at a New England Farm House, Harper’s Weekly, 1871. Courtesy The New York Historical Society. On the table, they’re cutting into an immense chicken pie. Also, take note of the celery holder. 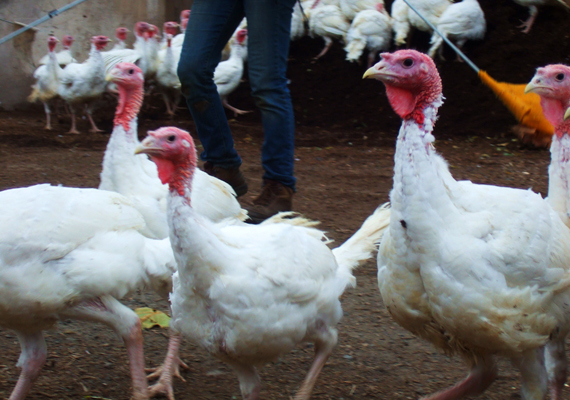 Thanksgiving, and food that accompanies it, did not evolve into the holiday we know today until the mid-19th century. Over the years, Forefather’s Day sort of merged with annual harvest festival traditions and became a modern Thanksgiving. A lovely sentiment, when you consider that our country was divided by war. Today, I think the true beauty of the Thanksgiving feast lies in the side dishes. The turkey in omnipresent, but what is served alongside it makes every family’s celebration individual. So what’s you’re Thanksgiving like? Is it traditional New England fare, or does it reflect your own regionalism or ethnicity? And if you were going to jazz up your holiday table with a 19th Century side dish from the menu above, which one would it be? Get this for your kitchen. My latest on Etsy is about the 19th century invention that has innovated my kitchen: the mechanical apple peeler. I’ve never minded paring apples by hand, but it is time consuming. As opposed to fiddlin’ or courtin’, I usually binge watch TV shows or catch up on NPR while spraying the counter and floor in a sticky snowfall of peels and seeds. But this holiday season, I’ve added a tool to my kitchen arsenal that will make my share of the pie baking so much easier: a mechanical apple peeler-slicer-corer. When I sent my first fruit through the cranks and blades of my cast-iron peeler, it blew my mind. I use the apple peeler to recreate a 1763 recipe for apple and pumpkin pie, which I think is one of the best recipes I have ever made while writing Four Pounds Flour. It is simple. It is sooo delicious. It is the new/old pie that is going to rock your Thanksgiving table. 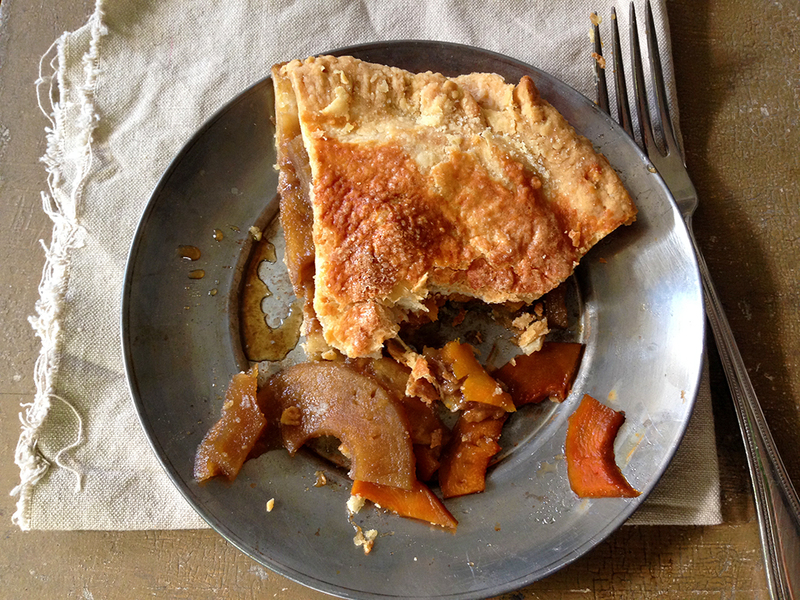 1763 Apple & Pumpkin Pie – a recipe well worth making. The finished pie had all kinds of caramelized sugar and molasses qualities as a result, giving it a taste somewhere between sweet potato casserole and apple crisp. It’s an excellent addition to your Thanksgiving feast as is, but there is also room for adventurous bakers to play with texture and flavor. Make it. Read it. Do it. From Harper’s Weekly, November 28th, 1885. The Washington Market of to-day is not the Washington Market of old. It is a much fresher and more healthy-looking place than the old ramshackle affair of former years. The Thanksgiving Eve surroundings of Washington market are, however, the same now as they have ever been. The busy buyers of turkeys and other Thanksgiving Day edibles swarm about it like bees around a hive, and jostle one another in its narrow passageways. Big turkeys and little turkeys hang, cold in death, from rows upon rows of cruel hooks, their plump or skinny, white or pinkish breasts decorated with little bright-colored rosettes, in mockery of the pitiless fate that has already befallen them, and the cruel mutilation which is to overtake them on the morrow. Ducks and geese and chickens are piled in mounds on the zinc covered countered, and the carcasses of fallen deer hand from hooks, while banks of green-topped celery and rosy-cheeked apples lend color to the scene. 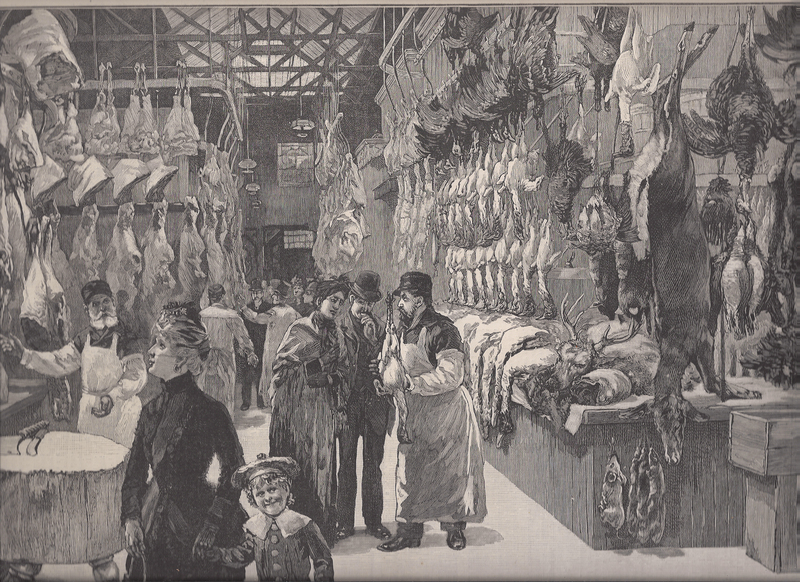 Small tradesmen fill up the spaces between the regular market stalls with appetizing stores of hares, rabbits, and other small game, and big butchers in iron-starched white or checked aprons move around like jolly warders at a fair. At the street corners outside of the market little rosy-cheeked girls, and old women whose cheeks are no longer rosy, sit behind huge baskets of oranges and apples. [In this image] The evening rush has not yet set in. A few hours later, and the passageway will be almost impassable, and there will be an indescribable confusion of sounds, as shrill-voiced women clamor for Thanksgiving bargains, and the vendors in the market cry forth the excellence of their wholesome wares. If FDR had not declared Thanksgiving the fourth Thursday of the month instead of the last, November 28th would be Thanksgiving eve this year, too! 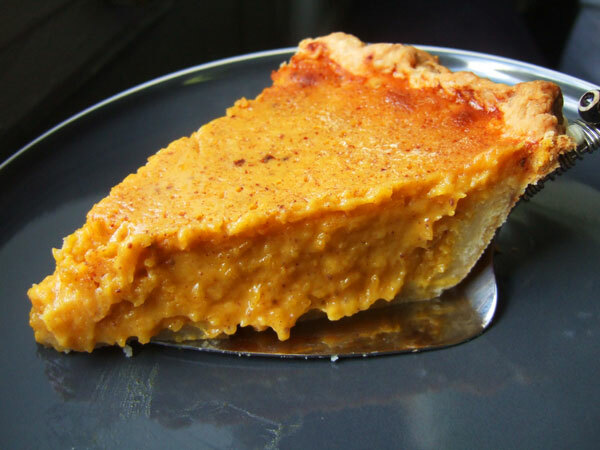 A pumpkin pie with sweetened condensed milk. Can I get a hell yeah? If you are going to be in NYC anytime in the next month, be sure to stop by the New York Public Library to catch the Lunch Hour NYC exhibit. It’s free and cute and you’ll learn a lot of fun facts about food. The coolest part of the exihibit is the installation of a functional automat. Automats were the precursors to fast food; meals were made from scratch at commissaries all around the city, then shipped to the automat restaurants. The food was placed behind little windows, and after dropping a few coins in a slot, you could open the doors and retrieve you treats. A new automat opened, and closed, on St. Mark’s street a few years ago. Horn & Hardart, the company that innovated the automat concept, was just as well known for the quality of their food as their unique way of delivering it. At the Lunch Hour exhibit, you can play with their automat machine, opening the doors and such. You won’t find any mac and cheese or baked beans inside, however–but they did thoughtfully include recipes of all the restaurant’s most famous dishes. Horn and Hardart’s automat, from Lunch Hour NYC. 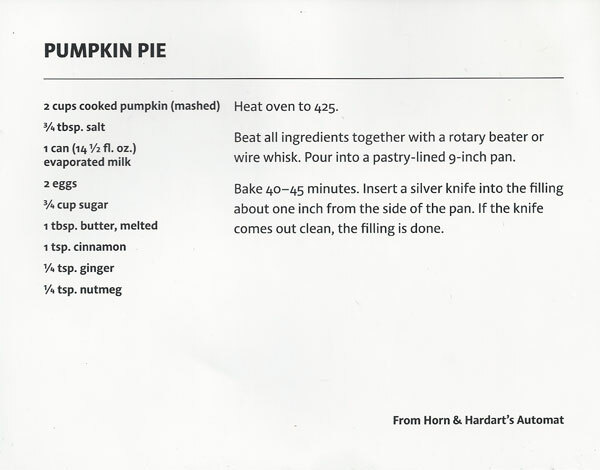 One of the recipes I grabbed when I visited was Hron & Hardart’s recipe for pumpkin pie. I had a pie pumpkin hanging out in my kitchen; it had been a Halloween decoration, and I decided it was time for it to go to a better place. Inside me. I roasted it, which is an easy way to process pumpkin–see how here. I also made a crust from scratch from this recipe, which is my go to pie crust. The filling was easy to mix up and the pie doesn’t bake for long. The recipe tells you “Insert a silver knife into the filling about one inch from the side of the pan. If the knife comes out clean, the filling is done.” I’ve never read pumpkin pie instructions so specific–a silver knife? Using this method, the center comes out underdone and extremely creamy. I’m not sure if I liked it though, being used to a firmer pie. But the wildest thing about this pie is I realized I made a HUGE mistake when I baked it that turned out to be wonderful. I only just now noticed that the recipe calls for evaporated milk NOT sweetened condensed milk, which is what I used. But holy moly, have you ever made a pumpkin pie with sweetened condensed milk? It’s astounding. The caramel-ee flavor of the sweetened condensed milk really comes through in the final product. Creamy, burnty sugary, pumpkin…awesome. God pumpkin pie is great. Why don’t we make it year round? I guess something about it just doesn’t feel right in the summertime. Left: What a centerpiece! From Betty Crocker’s Party Book, 1960. Turkey has been and always will be the star of a traditional Thanksgiving menu, but 18th and early 19th century menus commonly featured multiple meats. Local game, like venison, often made an appearance. 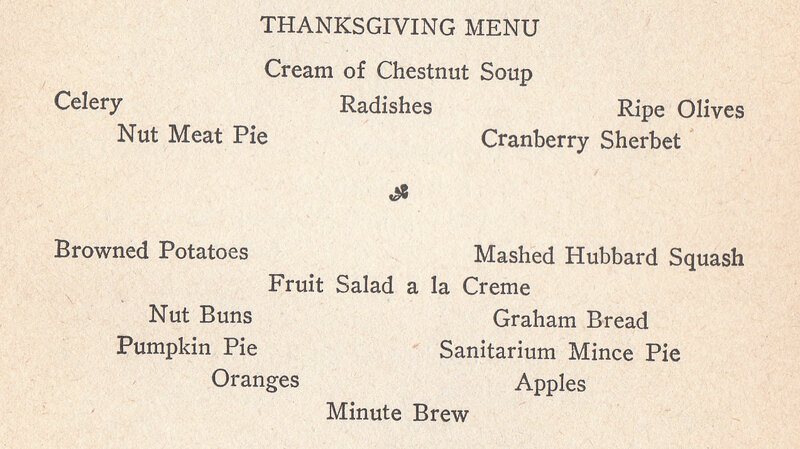 Recipes for mince meat pie and “Thanksgiving Chicken Pie” abound in historic text. And Sarah Josepha Hale, the Anna Wintour of the 19th century, insisted that turkey be served along side ham or tongue. It’s likely he may have also suggested a main course of Roast Protose with Dressing. Protose, a mysterious, early faux meat, was produced commercially up until the last decade. It was made from (possibly) some combination of peanut butter and wheat gluten. 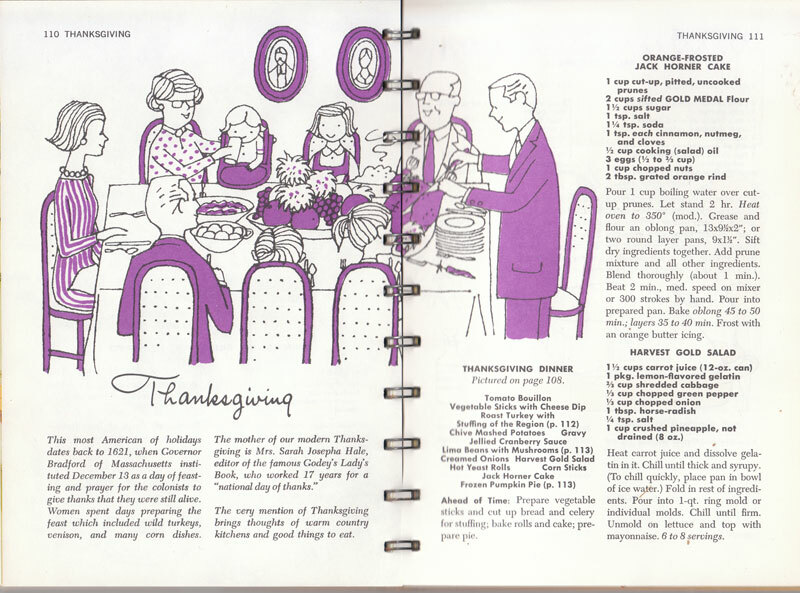 And lastly, let’s kitsch it up a bit with a menu from Betty Crocker’s Party Book, published 1960. Please note the lemon jell-o and horseradish salad. For historic Thanksgiving recipes interpreted for the modern kitchen, including pumpkin pie, squash, and stuffing, go here! I’ve often said that any object your heart desires can be found within the boundaries of New York City; however, that comes with a short list of items that are extraordinarily hard to track down in the city limits. At the top of that list is a working hearth. So you can imagine my amazement when, about a month ago, the executive director of Old Stone House in Park Slope dropped me an email to let me know that the museum owned an outdoor, working hearth. Naturally, my first impulse was to cook an entire Thanksgiving dinner. Which is utter insanity, considering that my hearth cooking experience up until this point has been fairly limited. But I was excited by the challenge: our foremothers did it, therefore there’s no reason I should be incapable of doing it too. This Sunday, November 22nd I am going to be cooking up a storm at the Old Stone House in Brooklyn. I’ve got a traditional, Revolutionary Menu in the works. There is a chance that everything will come out burnt on the outside, and raw in the middle. But either way, you’re invited to join me in my culinary adventure! The event is free and open to the public; I’ll be serving tasting portions of hot-off-the-hearth food from 12-3pm. I want to mention that the fine folks at D’Artagnan are donating some of their exemplary meats for the occasion. The official press release is below. I hope to see you there! Limited tastings will be available.